The global robotics industry experienced good growth during 2007-2012, but growth is expected to moderate over the next five years and reach an estimated $38 billion by 2018. Growth is expected to be driven by robotic usage in education with artificial intelligence, prospective huge demand for robots used in restoration work at disaster sites such as Fukushima, rescue robots, and growth in robotic toys. This report is geographically segmented in four regions: North America, Europe, Asia Pacific, and Rest of the World. Europe dominates the industry. Competition seems moderate because it is a highly capital-intensive industry. The author has identified that high prices, highly technological and complex features, human dependency, and ethical issues regarding complete automation are the major growth challenges. Industrial automation, demographic changes, product quality improvement, operational efficiency, execution of repetitive work, and ability to work in risky environments are the industry major drivers. This market report is an indispensable reference guide for materials suppliers, product manufacturers, investors, executives, distributors, and many more that operate in this market. To make business, investment, and strategic decisions, you need timely, useful information. This study provides understanding of recent industry scope and overview, global macroeconomic overview, relative market attractiveness by region, annual industry trend, emerging trends, industry forecasts, Porter's Five Forces Analysis, product launches, and mergers & acquisitions that determine the regional and segmental opportunities, competitive landscape, and profitability trend and analysis of the major industry players. The key insights sections portray beneficial information on an industry segment's growth and regional growth trends. This comprehensive guide from provides readers with valuable information and the tools needed to successfully drive critical business decisions with a thorough understanding of the market’s potential. 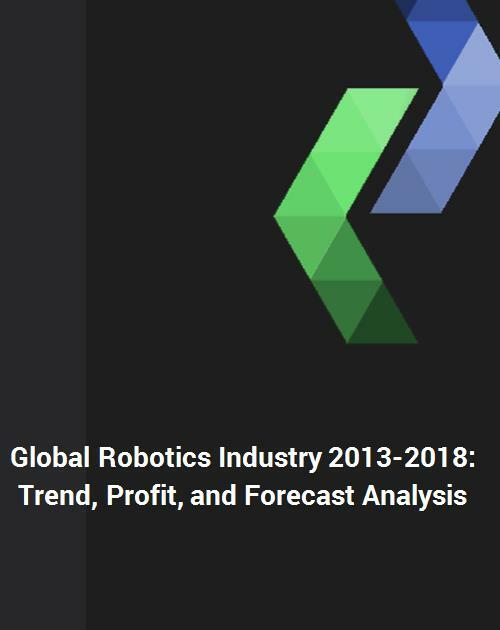 This report will save clients hundreds of hours in personal research time on a global market and it offers significant benefits in expanding business opportunities throughout the global robotics industry analysis. In a fast-paced ever-changing world, business leaders need every advantage available to them in a timely manner to drive change in the market and to stay ahead of their competition. This report provides business leaders with a keen advantage in this regard by making them aware of emerging trends and demand requirements on an annual basis. This study is intended for senior level executives, sales, OEMs, marketing and business development professionals at various nodes of value chain of this market. This multi-client market study is used by small to multi-national Fortune 500 companies and utilized for a variety of reasons as follows.